There are many ways your divorce settlement can affect your Chapter 13 bankruptcy and vice versa. Completing Chapter 13 bankruptcy is a lengthy process, typically taking three to five years to complete. During this time, many aspects of your life may change, including a possibility of divorce. If you are working through Chapter 13 and considering divorce, or if you are going through a divorce proceeding and are considering filing for bankruptcy, talk to your bankruptcy lawyer about the specific ways you can expect the divorce to affect your bankruptcy. Below are a few general ways bankruptcy intersects with divorce when one spouse files for Chapter 13 bankruptcy on his or her own. When you file for bankruptcy, your non-exempt assets go into the bankruptcy estate. This is the pool of legal and equitable interests you hold at the time of the bankruptcy. Once property is in the bankruptcy estate, a divorce court cannot divide it between spouses. This delays the couple’s property division for as long as it takes the bankruptcy court to grant the divorce court permission to divide assets in the filing spouse’s bankruptcy estate. In a Chapter 13 bankruptcy case, the court determines how much disposable income the filer has to put toward his or her repayment plan. 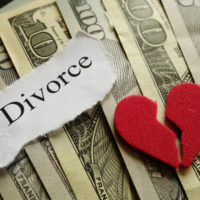 Filing for divorce and acquiring new financial obligations, like alimony and child support, will reduce the amount of disposable income an individual has available. This can alter his or her repayment plan and even make him or her eligible for Chapter 7 bankruptcy. In this latter scenario, the individual can convert his or her case to a Chapter 7 bankruptcy if he or she chooses. When a divorce settlement leaves one spouse indebted to the other, the spouse who is owed money can become a creditor in the other spouse’s bankruptcy case. This means that the debt the filing spouse owes his or her former partner is covered by the bankruptcy case and the owed spouse’s rights to collect repayment for the debt are protected. You cannot discharge alimony debt or child support debt through bankruptcy. However, in certain circumstances, you can discharge other personal debts, like credit card debt and debt you owe your former partner for reasons other than alimony or child support, like buying out a share of your family home. Your lawyer can discuss which debts are dischargeable and which are not with you to help you determine whether bankruptcy is the right choice for your debt management. As you can see, there are numerous intersections between divorce and bankruptcy. When you find yourself caught in these intersections, work with an experienced divorce lawyer who also has knowledge of bankruptcy law. Contact our team at Goodblatt • Leo today to schedule your initial consultation with us and get started on your case.